Dear Tricia, Oh pastry guru, can you answer a question for me?? I am making cupcakes for a friend's baby shower next weekend. I found these, which I like. (See above photo!) However, one part of the recipe says to make the flowers out of fondant and if you click print recipe it suggests using royal icing. What is the difference? I have heard scary things about fondant. I'd like the whole cupcake to be edible. 2. It's expensive and you either have to go a cake decorating store to buy it, or make your own, which people rarely know how to do. 3. It's just sugar. Buttercream frosting has butter in it. And butter is awesome. 4. It makes things look like you don't want to eat them. And frankly, as much as I like to "eat with the eye first," I also like food that looks like food. I don't want to be scared of a cake. So, with that aside, lets address your fondant vs. royal icing-on-the-baby-shower-cupcake-issue. While the cupcakes you intend to make are lovely, they look a little difficult. But I'm not doubting your capabilities, lets just find the easiest way to make this happen. Royal icing isn't the greatest idea for a very delicate looking cupcake as the picture shows (I'm guessing the food stylist used fondant), but it's an easy way to get the basic gist of what the photo shows you. Let me get my megaphone to explain something to everyone first. Funny how royal icing is called royal but its not like it has a British accent or anything. So here's how you can make the petals with royal icing. Follow said recipe. Pick your color. And either in a piping bag, or a ziploc bag with the corner snipped off with a pair of scissors, pipe a tear drop shape that is the size of half the top of your cupcake onto a piece of wax paper or parchment paper. So if you're using a standard cupcake pan, pipe 1" tear drops. Next to that pipe another tear drop. Repeat. By the look of the photo, you're going to need about a dozen of these per cupcake. (I'm already exhausted just thinking about it.) 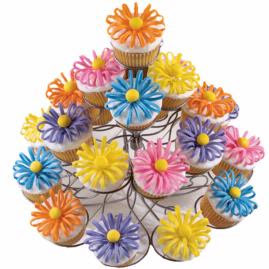 For every cupcake you're also going to need to pipe a small circle for the center of the flower. (That's where the magic happens, according to my 9th grade biology teacher.) These are going to take a day to dry. When they're dry, gently peel them off the paper and put them upright in a circle on the cupcake frosting. Once a dozen of them are settled, put the royal icing center in the middle to complete the flower. Using fondant is also an option, but that would involve you rolling it out, cutting tiny strips in very straight lines and quickly shaping them into teardrops before they harden. Again, totally do-able, but more time consuming than the royal icing and much more expensive. At this point I'd go with the royal icing. But I'm also the person who tends to conveniently get "food poisoning" in order to skip baby showers, so that should tell you something.